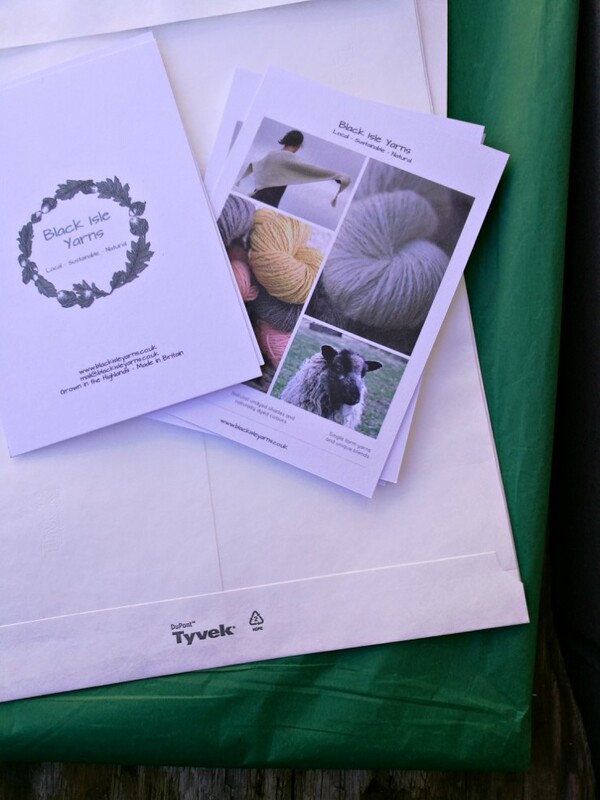 I put a lot of thought into the packaging I use for Black Isle Yarns. It is important to me that I use sustainable packaging while also protecting precious yarn when it heads off to a new home. 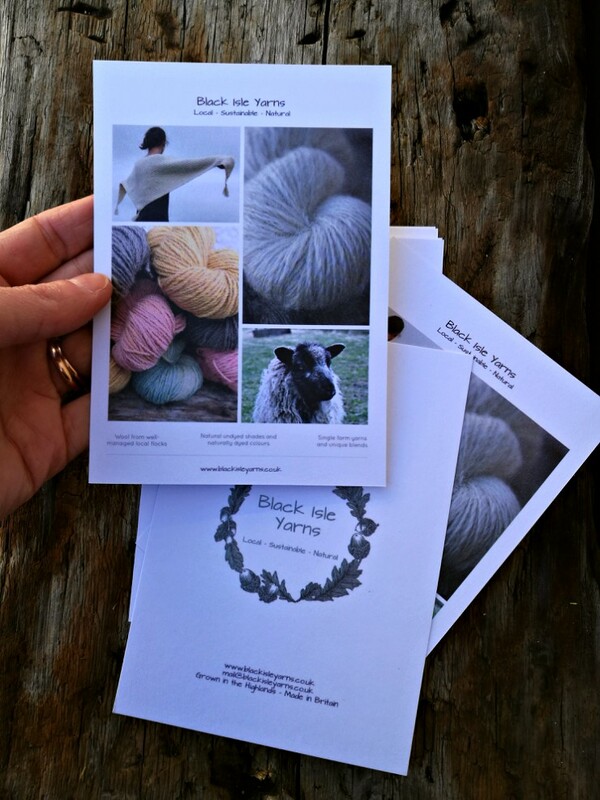 Late last autumn, just a few days before Loch Ness Knit Fest, I decided (as one does) that I really needed leaflets before the show – so that I had something pretty to hand out rather than business cards. I was determined to use recyled paper for these and after a little research settled on using Face Media Group and their 350gsm 100% recycled pulp board. This is a beautiful quality, fully recycled, matt thick paper. When I got in touch for a quote I was within a couple of hours of their cut-off for having a proof signed off in time to be printed and posted before the show. My contact was very helpful and I took to BeFunky (my usual photo editor and collage maker) to quickly put together a front and back design – considering the amount of time I had (and the % of that time which was spent checking for errors over and again, as I had no one else around to take a second look at it for me) I am very happy with the end result. Face Media kept to their end of the bargain and my pretty cards arrived just in time for LKNF (which I am very much looking forward to attending again in 2018 – this year is 19 to 21 October). When I first started sending out parcels of Black Isle Yarns yarn, just over a year ago, I used cardboard boxes in a range of sizes. They seemd to be the most sustainable option I could come up with and I sealed them with paper tape. However, one parcel came back to me, having been lost in the post for a few weeks (and quite some time after a replacement parcel had been sent to the person who was missing theirs). Aside from my pleasant surprise that it came back to me eventually I wasn’t happy with the state of my packaging – the box was bashed and had holes in the corners. This worried me as I don’t want beautiful yarn to be damaged before it reaches it’s new owner. I did some research into packaging and eventually settled on using Tyvek envelopes. They are sturdy and waterproof and strong enough that they can be re-used several times (which I would encourage, I always re-use mailers for personal posting) and, at the end of their life they can be recycled (and if they do end up in landfill they won’t leach into groundwater because they are chemically inert and don’t contain binders, fillers and plasticizers). I sourced my original batch from Amazon UK and am very happy with them. I will continue using them although I will search around for a new supplier for future purchases. I like to wrap all orders in tissue paper, which is something I have done since I first started sewing commissions several years ago. 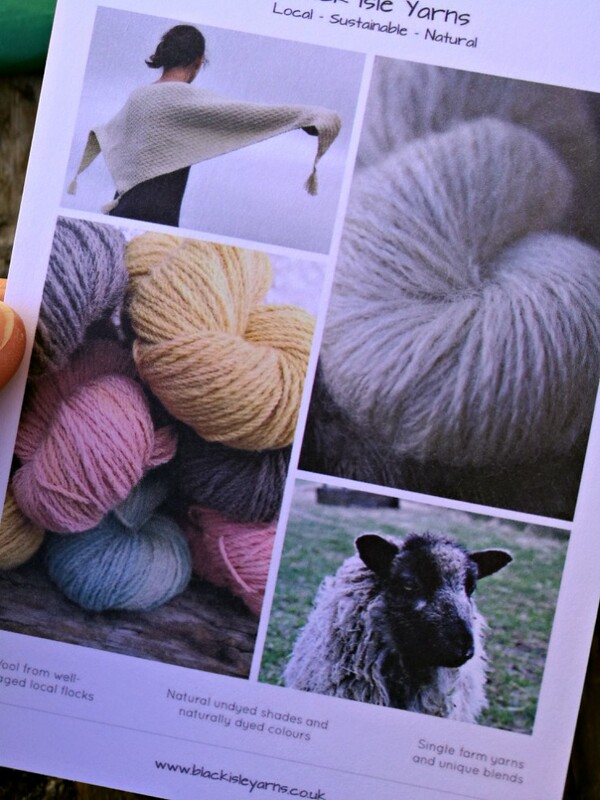 I have always used a deep, fairly bright, green shade which I love and have carried on into Black Isle Yarns. My current batch of tissue paper is not as environmentally friendly as I would ideally like and I have done some research into what to replace it with – which will be in the near future as I am running low. Although I say that my current batch is not environmentally friendly it is, of course, recyclable but it could be better. I plan to move to an acid free and recycled tissue paper from Tiny Box Company. However, this presents a dilemma – there is no forest green shade! I am quite drawn to the Turquoise or Golden Yellow (such a happy colour), but wonder if I should play safe and stick to the pretty Grey shade. What do you think?! I’d love to hear from you if you have any thoughts on packaging – especially if you can think of areas I could improve on. Or if you have received a parcel from me and would like to let me know how you found it.